We asked if a few of you wanted to come to Kart2Kart in Sterling Heights and race us, so we only slotted out a 7-9 pm time period. Instead, 78 people showed up to race and there were about 100 total with those who just wanted to watch. There were engineers, PR people, booth professionals, other writers, and of course some super fast readers. GM, Ford, Mazda and Chrysler all had people on hand, including the head engineer for the SRT Viper and a guy who drove a 2015/16 Miata mule and parked it outside. 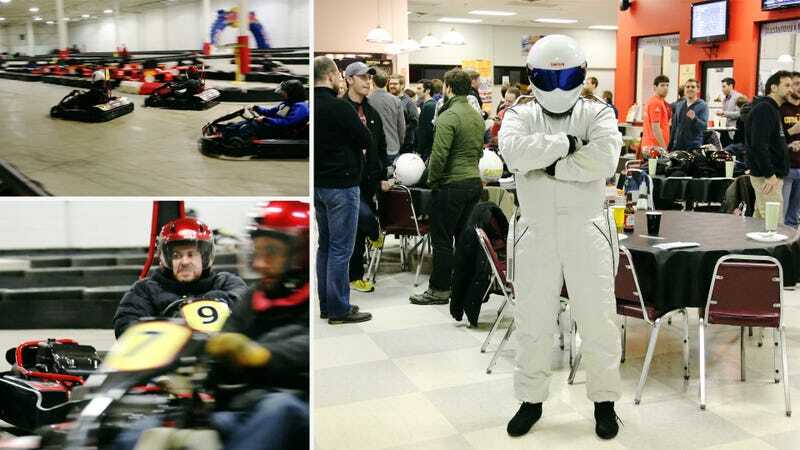 Did we mention there's a guy who dressed as The Fat Stig? He was not slow. After a round of qualifying and practice they broke us out into heats based on our speed, but not before Kart2Kart's owner Tony ordered all 100 of us free pizza. What a guy! The fastest Jalopnik writer, of course, was former kart racer Travis, who was fast enough to make it into the elite heat. Unfortunately, a clerical error put him right behind me in the third fastest heat and he (and Michael Banovsky) managed to push me out of the way. Jason spun out in his heat and did his best to catch up. Check out that intense face. You can see the fastest time from the winner above who, it should be noted, is both a GM engineer and the guy with the record time for the track that weekend. Big props to Bill and Martin for finishing second and third. It was a great time and we're definitely going to do it again next year. Share your memories and photos of the event below.